The structured programmes will provide a platform for female entrepreneurs to discover their potential in a supportive and safe space. With the guidance and mentoring of industry professionals, participants will understand more about the complexities of market dynamics and how to counter possible challenges they may face while on their entrepreneurial journeys. With the opportunity for further self-discovery, participants can familiarise themselves with their strengths and weaknesses, and how they can be utilised in crucial times once prepared with the knowledge to convert all challenges into opportunities, and competition into partnerships and collaborations. 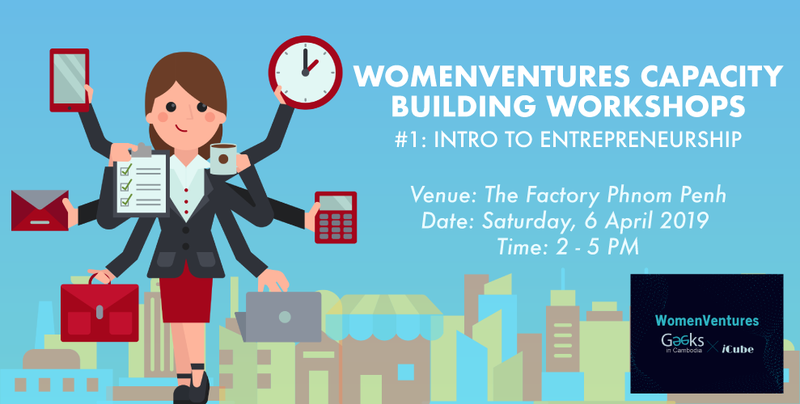 The first workshop will be held from 2 to 5pm on Saturday, 6 April at the Factory Phnom Penh. The theme would be Intro to Entrepreneurship, tackling areas including the difference between business and entrepreneurship, startups, and looking at the entrepreneurial approach to jobs. For more information please visit this link, iCube’s website, or email us at: contact@geeksincambodia.com, We would appreciate greatly if you would sign up on this form: https://goo.gl/QTQhXS, for us to have a better idea of how many of you would be joining us. See you there!